Because Ellery missed an entire week of school, I took it upon myself to provide some "enriching" activities while at Grandmas. 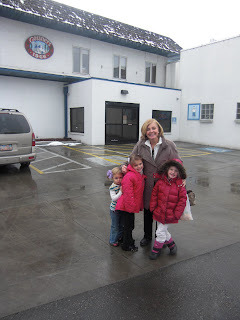 Wednesday we ventured out to the Gossner's Cheese Factory. I was hoping for a tour, but because of security and sanitary reasons they do not offer them. They did however have windows to catch a glimpse of the factory in action. 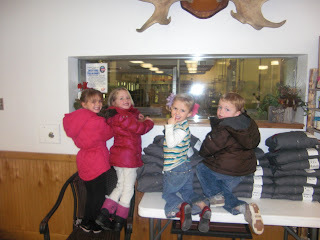 Ellery and her cousins had a great time watching the workers handle giant blocks of cheese. They probably weighed more than all 4 of them combined! Notice the cheese in Ellery's hand. We just about ate them out of the factory. Gossners is famous for their swiss cheese and also their shelf milk. Shelf milk was intriguing to me since I have never tasted or used it before. The little store at their factory had a tasters bar. We helped ourselves to lunch there. 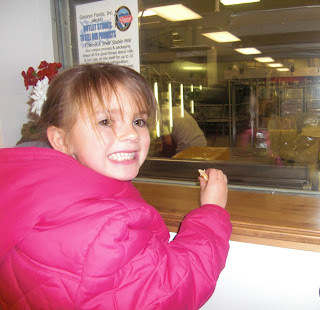 My children had quite their fill of cheese, curds, spreads, and flavored milk galore. Their flavored milk includes things like root beer, mango, orange cream, chocolate, cookies and cream, vanilla....these are chock full of sugar. Not my cup of tea. Of course they were my children's though. However, I was surprised and pleased by the taste of their 2% milk. I bought 2 cases for $8.00 a piece. 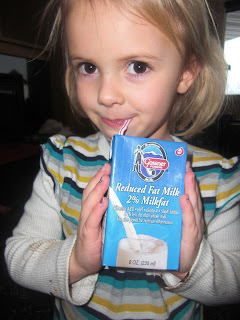 I thought these little milks are perfect for on the go, and school lunches. I also bought 2 cases of whipping cream. These were more expensive at $21.00. However, I was especially excited about these. I love that I can buy them in 8 ounce sizes. They are the perfect serving for my family, and for most of my recipes. 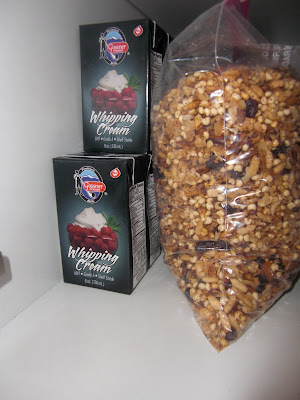 It seems like I am constantly running out of whipping cream or buy too much and it goes bad. This is a perfect solution. I have already used 3 in 3 days! Two to make Agave Whip Cream to dip those yummy Chocolate Valentines Cookies in, 2 days in a row! They stack neatly away in my pantry. Refrigerate for several hours and you are ready to go. The retail website for Gossners milk is Milk on the Move. I am horrified though at the price. You will see the case I paid $8 for is $36 and the whipping cream is $57 instead of $21. Brutal! Thank Goodness for the outlet store. Maybe I will buy a bunch and start selling them! I did notice they are selling them on amazon for $50.